(im'pe-tī'gō), Avoid the misspelling/mispronunciation infantigo. A contagious superficial pyoderma, caused by Staphylococcus aureus and/or group A streptococci, which begins with a superficial flaccid vesicle that ruptures and forms a yellowish crust; most commonly occurs in children. an acute contagious superficial infection of the skin. It is characterized by vesicles that rupture, leaving a purulent exudate that dries into golden crusts. A contagious superficial pyoderma, caused by Staphylococcus aureus or group A streptococci that begins with a superficial flaccid vesicle that ruptures to form a thick yellowish crust, most commonly occurring on the faces of children. 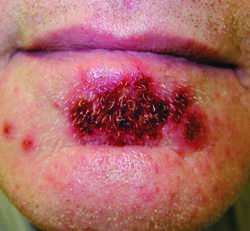 Synonym(s): impetigo contagiosa, impetigo vulgaris. The infection is highly contagious and spreads easily among infants, children, and the elderly, with outbreaks related to such predisposing factors as poor hygiene, crowded and unclean living conditions, warm climate, malnutrition, and anemia. Topically applied mupirocin ointment, related drugs, or oral agents effective against staphylococcus and streptococcus are used to treat the infection. Mupirocin also eliminates nasal carriage of the offending organisms. Prescribed treatment must be continued for 7 to 10 days even if lesions have healed. Nonprescription antihistamines may be used to reduce itching. The fingernails should be cut and, if necessary, mittens applied to prevent further in-jury if the patient is unable to avoid scratching. Diversional activities appropriate to the patient's developmental stage are encouraged to distract from local discomforts. Black patients may develop deeper inflammation than whites and should be informed that this may result in hypopigmentation or hyperpigmentation changes after the inflammation has subsided. The school nurse or employer is notified of the infection, and family members are checked for evidence of impetigo. The patient can return to school or work when all lesions have healed. A rare infection, usually occurring in infants, caused by a strain of Staphylococcus aureus that produces a toxin that splits the epidermis. A rare and occasionally life-threatening eruption that typically occurs in the third trimester of pregnancy. It is pathologically indistinguishable from pustular psoriasis. Synonym: Hebra disesae. usually a staphylococcal skin infection marked by vesicles or bullae that become pustular, rupture, and form yellow crusts. In animals a superficial infection of the face of newborn piglets, the abdominal skin of puppies, and one of the teats of cows, go under the name of impetigo. See also udder impetigo, contagious porcine pyoderma.